JNN 28 Jan 2014 Doha : A prominent Gulf-based Sunni Muslim cleric called on Saudi Arabia to stop backing Egypt’s military-dominated authorities, accusing them of using Saudi money to kill Egyptians protesting at the overthrow in July of an elected Islamist president. But Youssef al-Qaradawi, an Egyptian-born cleric based in Qatar, said the strong backing that Saudi Arabia, the birthplace of Islam, had provided military-backed Egyptian authorities which had crushed Islamist opposition since Mursi’s removal was wrong and should be withdrawn. “It’s surprising that the Saudi government gave billions of dollars to support the (anti-Mursi) coup and the coup leaders and those who are far from God and Islam,” Qaradawi, one of the most influential Sunni Muslim clerics in the Middle East, told Reuters in an interview conducted by email. “The only thing that links them to their neighbouring countries is the language of interests and benefits,” said Qaradawi, who heads the International Association of Muslim Scholars, a grouping close to the Muslim Brotherhood. 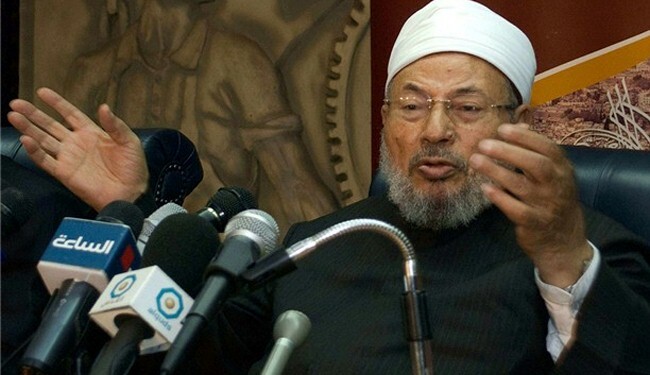 Qaradawi said the Egyptian military, led by Field Marshal Abdel Fattah al-Sisi who is now expected to run in Egypt’s pending presidental election and win it, was using Saudi funds to “kill innocent Egyptians” instead of helping the poor. “I call upon the people of Saudi Arabia and on the Saudi regime to stand with the Egyptian people against the murders and executioners, to stand with the right against wrong, to stand with the slain against the killer, to stand with the oppressed against the oppressors,” he said. “These rulers hate Saudi Arabia and its ruling regime. They do not believe in sharia,” he added, referring to strict Islamic law applied in Saudi Arabia. The military-backed authorities have cracked down hard on Mursi’s Muslim Brotherhood since July, smashing sit-in protest camps in Cairo and killing hundreds of demonstrators. Most Brotherhood leaders including Mursi have also been arrested and the group has been designated a terrorist organisation, although it formally renounced violence four decades ago. The United States said in October it would withhold deliveries of military hardware and $260 million in cash aid for Egypt’s military-backed government pending progress on democracy and human rights. The hereditary rulers of most Gulf Arab states were close allies of longtime Egyptian autocratic President Hosni Mubarak before his fall to a popular uprising in 2011, and they saw the subsequent the rise to power of the Muslim Brotherhood in Egypt as a dangerous precedent that could embolden Islamists at home. But Qatar, where Qaradawi is based, kept close ties with the Egyptian Brotherhood and lent or gave Egypt $7.5 billion during his Mursi’s one year in office. Asked about who he thinks was behind the wave of bombings that targeted security compounds in Cairo on the third anniversary last Friday of Mubarak’s downfall, Qaradawi said the Muslim Brotherhood was distant from such practices and suggested that Egyptian intelligence services might have provoked the attacks to stoke popular anger against Islamists. “It is unreasonable to leave those buildings…, such as the Directorate of Security in Cairo, unguarded in the circumstances that have prevailed…This act has the fingerprints of Egypt’s intelligence service all over it. It should also be noted here that Former Dictator Hosni Mubarrak was even a strong Ally of the US and Israel , while the Latest Muhammad Morsi who came to power by Democratic Process , and was supported by Muslim Brotherhood , which is a Islamist Political Party of Egypt , which was also supported by the US and CIA, and this was the fact behind the Support Provided by Qatar , which is again a Strong Ally of US in the region, and is fighting hard to become the favorite of the US , So by achieving the Backing of the US and Pentagon, it can claim the Leader of the Persian Gulf , and thus is in Conflict with the Saudi Monarchy,which at present enjoys the US backing in the region, But the Latest Upset in Egypt’s Political Scene has shown the changing trends and favourites in the region. As told even earlier that Qatar gave an aid package of about US $7.5Billion to the Egyptian Government Led by Muhammmad Morsi ,to give it a sound footing , but ON Contrary to all this the Saudi Monarchy and its Allied Persian Gulf Shiekhdoms , gave about US12Billion to the Dictator General Fatah SiSi to greet him on his Coup , as he came to Power against the So called Democratic Elected Government of Muhammad Morsi . While in the Present Scenario of Egypt , it is the First time that the Saudi Money has been used against the US Interest , as the US and the Western Powers were Pro Morsi . While The Army Dictator General Abdul Fatah Al SiSi is totally and wholly backed by the Saudi Monarchy. That also shows the Latest fear among Saudi Monarchy , as they are well aware of the Idea Floated by the US think tanks , that as the Saudi Monarchy has now no roots in their Country , and its down fall is Imminent , so the Best way to safe Guard the US Interest is to induce Democracy in the country , as it suits US very much , as it Masters in Inducing Puppet Democratic Rulers , In the name of Democracy , who can run as Puppets Rulers and can Implement the agenda given by the CIA , and in return these Puppet rulers can fill their coffers to make their fortune by the ill gotten Wealth of the Nation. This entry was posted in AFRICA, Middle East and tagged Egyptian Sunni Cleric, Mohamed Mursi, Muslim Brotherhood, Saudi Arabia, Sheikh Yusuf al-Qaradawi. Bookmark the permalink. SAUDI ARAB, THERE IS ONLY MUSLIM ARAB . THE WAHABIS SALAFIS ARE NOT MUSLIMS, THEY HAVE A JEWISH ROOT AND ONLY WISH THE WELFARE OF ZIONIST . THEY DRINK, INDULGE IN MISYAR AND ALL KIND OF VICES ARE WITH THEM , ALL FROM ARAB PETROL MONEY AND ISLAMIC TOURISM INCOME . JOIN HANDS SHIA SUNNI MUSLIMS KEEPING YOUR KHILAFAT DIFFERENCES INTACT IF YOU CAN’T SOLVE IT, THROW OUT THE INFIDEL WAHABIES-SALAFIS FROM ISLAMIC LANDS .MAKE MAKKAH MADINAH FREE FROM WAHABI POLLUTE.